University College London, (Optical Science Laboratory) chose Optical Surfaces Ltd. to supply the main corrector lenses at the heart of the spectrograph to be installed in the Gemini 8 m telescope being built in Chile. The corrector lens system contained within the innovative high-resolution optical spectrograph (HROS) will comprise some of the largest diameter lenses made in the UK for some years. Made from high-grade Herasil 1 (Heraeus, Germany) each of the three 536 mm diameter wedge corrector lenses were be surface finished to better than 1/4 p-v and the thickest element weighed in the region of 62 kg. Optical Surfaces were selected based upon their international reputation for successfully producing prime high precision optics for large telescope systems such as the William Hershel Telescope operating in the Canary Islands. 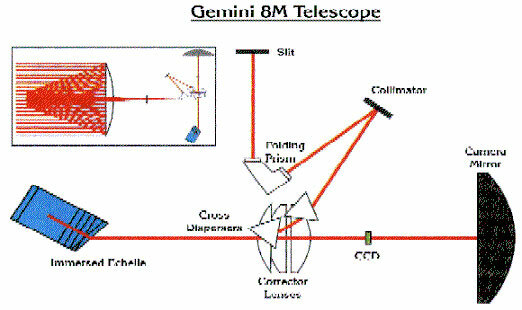 As part of a separate contract, OS Ltd manufactured the high quality 20 degree off-axis paraboloid collimator which is also shown in the diagram below. A result of its novel echelle spectrograph design and location at the Cassegrainian focus a few metres below the primary mirror, HROS is predicted to be the most efficient of the new class of high resolution instruments being used in large telescopes.